Spoiler warning! Spoiler warning! Spoiler warning! Why do people call "The Swarm" a disaster? I mean, it *is* a disaster movie, right? The corny plot revolves around Texas being invaded by vicious killer bees. Not content with killing peaceful Texans on picnic, they derail trains, make a nuclear power plant explode and wipe out several towns in gruesome fashion. Eventually, the bugs are lured out to sea, where they are incinerated en masse in a dramatic finale. What more can you ask for, LOL. 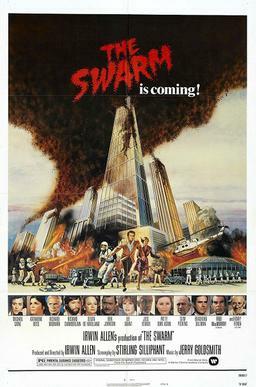 "The Swarm" is also fascinating - if that's the right word for it - as cultural studies. Is it really about killer bees? Or is the lethal insect simply a metaphor for something else entirely? The film ends with the following bizarre statement: "The African killer bee portrayed in this film bears absolutely no relationship to the industrious, hard-working American honey bee to which we are indebted for pollinating vital crops that feed our nation." I'm not the only person who suspects that "African killer bee" means "Blacks, Hispanics and illegal aliens". Not to mention Communists. If anything, this subconscious racism is the real disaster! Killer bees remind us that we're not really in charge around here anymore. Maybe we never were.